The challenge for this project was to find a complex network of relationships and find a way to display the data in an organized and visually appealing way. I chose to categorize the relationships and interactions within the Harry Potter novels. I chose this, not only because they were some of my favourite books growing up, but also because J.K. Rowling created a vast world of characters, and I wanted the challenge of including all of them. I really pushed myself to make this piece as clean and simple as possible, while showing all of the information I had collected. For this reason I went with a minimalist approach, with little extraneous decoration. My method was to organize and group elements as efficiently as possible so that it would be easy for a viewer to follow. I started by listing and collecting data for as many characters as I could find. I tried out a number of different ways to show all the information, eventually concluding that a relations circle would be the most efficient. 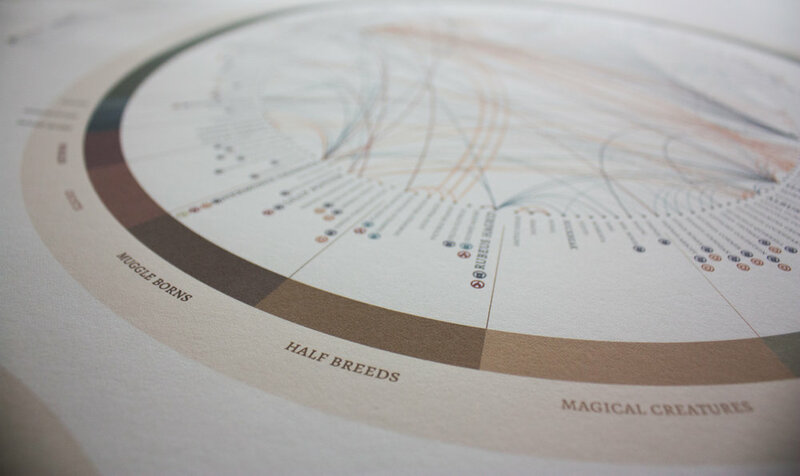 Once the data was collected I decided to create two rings - the first depicting all of the relationships between characters, organizing them by blood status and species. I used colour coding of the linear connections within the ring to show direct personal relationships between characters and symbolic badges beside their names to claim membership to different institutions. In the second ring I depicted climactic battles and deaths within the series, organizing the characters by how they died, (ex. killed, accident, old age or survived incident). These connections are also colour coded to the type of weapon used to attack or kill with directional arrows showing who was the inflictor and who the victim. The types of attack methods include; spells/curses, potions, stabbed, and other (for those that cannot fit a category). Those labelled other have symbolic badges next to their names corresponding to a legend giving more detail about the death.